If you like water related activities, or you're adventurous at heart, or you just want to get wet, then this weekend is ideal for you. So, get out of your comfort zone, round up some friends, pack your bathing suit, and head to either Lake Travis or Lewisville Lake for a good time on the water. If you pick Lake Lewisville check out this review of Lewisville Lake for this wet and wild weekend and if you want to make this a weekend trip, then book a hotel in The Colony or Lewisville - here are some choices for Lewisville. Or If you like camping, call Hickory Creek Campground which is a Corps of Engineers park with some great sites on the water. Read our review of Hickory Creek to learn more about this campground. You could make this a day trip, but you'll have more fun if you turn it into a weekend. If you arrive on Friday night and you're staying in Lewisville, head over to Sneaky Pete's for a fun evening. The food's not bad and the atmosphere is outstanding. Sneaky Pete's is on the water within one of the marinas and has a fantastic view of the lake. There are plenty of slips for parking your boat. You'll find a great outdoor patio, with a swimming pool, a gazebo bar, and two inside bars plus a dance floor as well as an inside restaurant. Round up your own team or join a group and play some volleyball (on one of four sand courts), relax around the pool with a cold drink and appetizers, and listen to some live music on the patio. There is usually a live band on Friday and Saturday nights and most weekends the crowd is fun and lively. If you're staying in The Colony, then mosey on over to The Dingy Bar & Grill at Pier 121 for food, music, and a good time. Charlie's is a funky, laid back, floating bar and restaurant at the Pier 121 marina. The food is burgers and sandwiches but it's tasty. The crowd is mostly boaters getting ready for a weekend or just coming off the water, and the music is usually lively (Jimmy Buffet, rock and roll, or a good mixture) and the crowd is friendly and fun. Typically, we will spend time in the pool and have drinks and appetizers at Sneaky Pete's then boat on over to Charlie's for music on the patio. rent a jet ski, party barge, or ski boat from Just For Fun (at Pier 121) or Flying & Floating Toys and enjoy the lake for fishing, skiing/boarding, cruising, or partying. There are a couple different party coves where boats raft up and spend the day socializing (ok - they're partying, drinking, swimming, tossing footballs or water balloons, etc.) - a great way to get to know some new fun people. go for a sail on a beautiful 70 foot catamaran. Big D Cats is designed for water adventures and the skipper and crew are committed to make sure you have an enjoyable, fun, and memorable trip. They offer day cruises, (including a swimming stop at the party cove), dinner and theme cruises, and moonlight cruises. You and your friends can charter the boat for your own sailing party or better yet, why not get married on the boat! if you have a boat then try something new - try a flying tube, banana, wakeboard, kneeboard, or water ski - if you don't have one, no excuses, most of the Lewisville Lake boat rental locations will rent you one. You might also consider buying a used boat for cheap if you don't already have one. It is possible to buy a boat at auction for a fraction of its retail price, as long as you know where to look. Many boat owners donate their vessels to charity when they no longer use them. The charity then auctions off these boats and uses the proceeds where they are needed most. This is an excellent way to get your hands on the boat that you have always wanted, while supporting a worthwhile cause at the same time. for the brave and adventurous, you need to call Flying & Floating Toys and sign up for a powered parachute or a parasail ride. This is the most thrilling and exciting way to see the lake and it'll be a ride you'll remember for a long time. if you have your own boat: enjoy the lake, head to the party cove if you're looking for a good time, hit the restaurants, and have Flying & Floating Toys meet you for a parasail or parachute ride. We also like to boat over to Stewart Peninsula Golf Course and play 18 holes of golf, then jump back in the boat, take a swim and cool off, then head over to Sneaky Pete's or Charlie's. Just For Fun, Flying & Floating Toys, Big D Cats all offer specials rates and savings for Texas Outside visitors so make sure you use one of their coupons and save some money. If Lake Travis is closer or you just want to head to the Hill Country and Austin, then Lake Travis offers similar choices for a wet and wild. Lake Travis is a huge lake with lots for good restaurants, pretty clear water, good party coves, and much more - check out our review of Lake Travis to learn more. 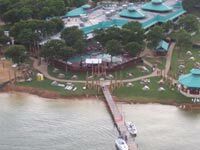 You have tons of choices for lodging on or near Lake Travis - hotels in Austin, lakehouse rentals, resorts, or camping. 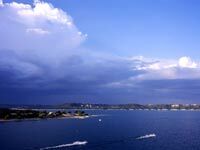 Here is a Lake Travis web site to help you select a place to stay. 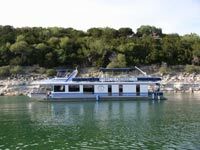 Our recommendation, since this is a wet and wild weekend, is to rent a houseboat and enjoy the weekend partying, cruising, and enjoying the lake - nothing beats houseboating and Lake Travis is a great lake to houseboat on. Check out our Houseboat Section to find where to rent a houseboat. If you have a few friends you'll find it's really very economical and more fun than a hotel. If you want to camp, there aren't a lot of choices. Pace Bend is a county owned park that has some great sites on a bluff overlooking the lake as well as sites on the water. There are a limited number of tent sites at the Mansfield Dam public park and boat ramp. The Oasis - if you have never been here, then this should be your first choice. The Oasis is huge with multi-tied decks high on a hillside over looking Lake Travis. Make sure you get here in time for the sunset - there is not a better place in Texas to watch the sunset. The food is ok, the atmosphere is outstanding, the place is really cool, and good live music on the weekends. Johnny Fins - Johnny Fins is a floating bar and restaurant with pretty good food and live music - and you're right on the water! Carlos & Charlie's - it doesn't get much better than Carlos & Charlie's - pretty good food, great view of the lake and marina, outstanding people watching, fantastic bar, concerts or outdoor movies on the beach, and live music. If you can't have fun here, something is wrong! The Pier - The Pier closed it's Lake Austin location (darn the bad luck - we had a lot of fun there) and relocated to Lake Travis (at least they are still around). It's a floating restaurant with burgers and more and good music on the patio. Don't party too hardy, because you've got to get up early to enjoy the day. If you don't have a boat, what are you waiting for, go buy one! But if you can't get it in time for this weekend, scoot on over to Just for Fun or some of the other Lake Travis Boat Rental locations and rent a waverunner, ski boat, pontoon boat, or party barge. Check for a coupon on this coupon page to save some money. Even if you own your own boat, you should still consider renting a houseboat for a weekend and using your boat to shuttle you to the restaurants, party coves, and fishing holes. Enjoy the Lake - here are some good coves for partying (Devils Cove usually has a 100 or more boats rafted together on the weekends); enjoy the food and music at any of the Lake Travis restaurants; you should be able to find some good water for skiing or boarding; there are lots of fish waiting for your frying pan; or you can just cruise the lake and marvel at the huge beautiful homes and wish you had one! Sip, Slip, and Slide - boat or drive over to Volente Beach Water Park - your kids will really have a good time here and if you don't enjoy water parks, then you can munch on some surprisingly good food and very good cold margaritas on the outdoor patio overlooking the park and lake. 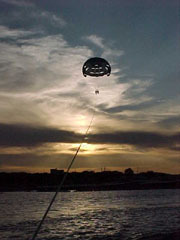 Check Out Some Fun Events - Lake Travis usually has some fun event going on during the summer. We've enjoyed the live concerts and outdoor movies at Carlos & Charlie's and Live at the Lake at Lakeway. 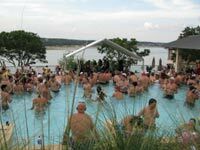 This year, each Sunday afternoon, Lakeway has free music beside their three tiered infinity pool over looking the lake.